Watch and listen to Mr. K.V. Kamath bring out simple yet powerful lessons on development of self and nurturance by a Leader. 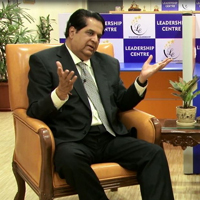 This podcast will help you understand the mind of Mr. Kamath as a young manager and the lessons that shaped him as a leader.Learn from Mr. Kamath as he breaks myths around nurturance and shares what it means to nurture others.